Happy belated Mask Monday! This week's Mask Monday review had to be delayed due to unforeseeable reasons, but better late than never right? This week's Mask Monday spotlight is on the My Beauty Diary (MBD) Strawberry Yogurt masks. I have been using My Beauty Diary masks for years now and most of them have a special place in my heart. Not only were they my first masks, they also work really well for my skin. My Beauty Dairy has a huge range of masks, over 30 types, and they are always coming out with new masks or tweaking their current formulations. 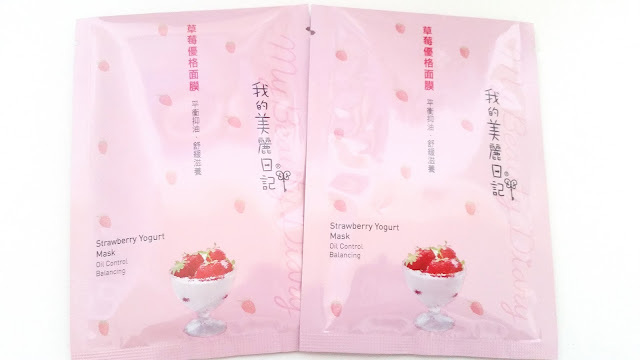 The Strawberry Yogurt masks are part of MBD's Natural Key Line. The Natural Key line is My Beauty Diary's original mask line and also the line with the most choices. MBD usually tweak their masks every year or so. Sometimes the tweak is small, where ingredients are added and/or taken out. While other times the tweaks are bigger, for example 2015's tweak changed the sheet mask's material. I've yet to try the new sheet mask material but I've heard good things about it. Anyways, let's get to know these MBD Strawberry Yogurt masks. Product Description: The MBD Strawberry Yogurt masks contains rich amounts of fruit acids, enzymes, and minerals to cleanse and moisturize the skin. Combined with the active lactic acid ingredients, the mask can help to balancing the oil composition of your skin, minimize the appearance of pores, reduce excess sebum and improve skin's texture. To Use: Cleanse the face first and apply toner. Take the sheet mask out of its pouch and remove its protective layer. Apply the mask onto the face and leave it on for 20 to 30 minutes. Remove the sheet mask and pat in any remaining essences. MBD masks usually comes with a lot of essence, so the excess essences in the pouch can be applied elsewhere, like the neck, body, etc. Ingredients: Water, glycerin, propylene glycol, butylene glycol, phenoxyethanol, chlorphenesin, aloe barbadensis leaf juice, triethanolamine, fragaria vesca (strawberry) fruit extract, fragrance, polysorbate 20, yogurt extract, sodium hyaluronate, xanthan gum, citric acid, enantia chlorantha bark extract, hydrolyzed rice protein, dipotassium glycyrrhizate, acer saccharum (sugar maple) extract, arctostaphylos uva ursi leaf extract, citrus aurantium dulcis (orange) fruit extract, citrus medica limonum (lemon) peel extract, codium tomentosum extract, hydrolyzed soy protein, laminaria digitata extract, lecithin, malva sylvestris (mallow) flower extract, polysorbate 80, saccharum officinarum (sugar cane) extract, vaccinium myrtillus fruit extract, carbomer, PEG-15 hydroxystearate, iodopropynyl butylcarbamate, polyglutamic acid, sodium hydroxide, sodium lactate, sodium PCA, glycosphingolipids, tocopheryl acetate. Manufacturing and expiration dates are found on the back of the box. 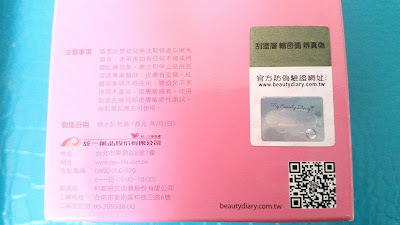 My Beauty Diary Natural Key masks generally last 3 years. Packaging: The box's packaging is similar to each of the mask pouch. The front features the product's name, a short description about the functions of the mask, and pictures of the main ingredients. The back contains more information as well as the ingredients. The differences with the box is that the box has additional sides, which also contains extra information, like the security stickers. (see image below) I'm not sure if the English versions (like the ones sold in Walmart and Target) have security stickers, but generally the ones found in Asian markets do. Scent: The masks has a sweet strawberry yogurt scent. It's quite delightful and the combination of the 2 is really lovely. The scent is more than mild, but I would not say it's overwhelming. Fragrance has been added to this product. Color: The mask sheet is white and the essence is clear. Texture: The essence is liquidy but a bit thicker than the usual toner. The sheet mask is soft and fits nicely with no stiffness. The sheet is also easily tear-able, so you can adjust the mask to fit your face. The authenticity sticker is a scratch-off type. Once scratched off, you'll see the numbers and letters. Follow the MBD website to find the authenticity area and enter the numbers. The website will tell you whether your masks are authentic or not. My Thoughts: Personally, I love strawberries and I always want to try out products that might potentially smell like yummy strawberries. So, that's the reason why I decided to try this mask out years ago. I fell for the scent and loved the skincare properties it offers, so I stayed with it over the years. My Beauty Dairy has changed some of the ingredients of this mask over the years, but the general stuff are still the same. 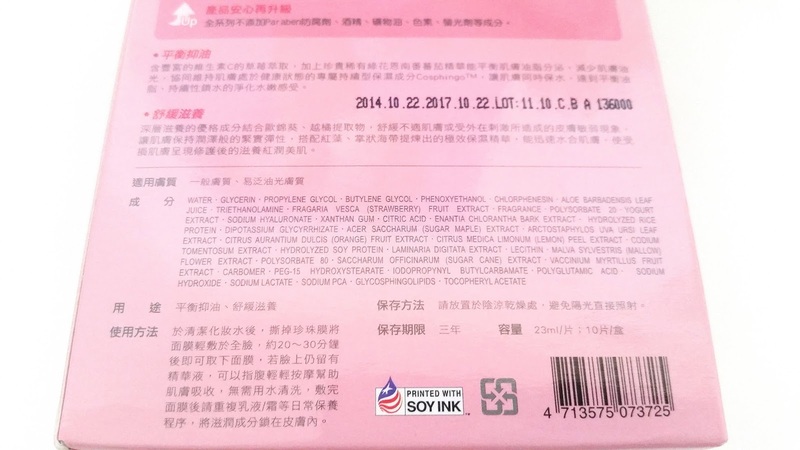 The more noticeable changes though are its packaging, the 2015 sheet mask material change, and the authenticity stickers that were added sometime in 2014. I shared in details regarding the authenticity stickers in a previous MBD mask review, so you can read more about it there. 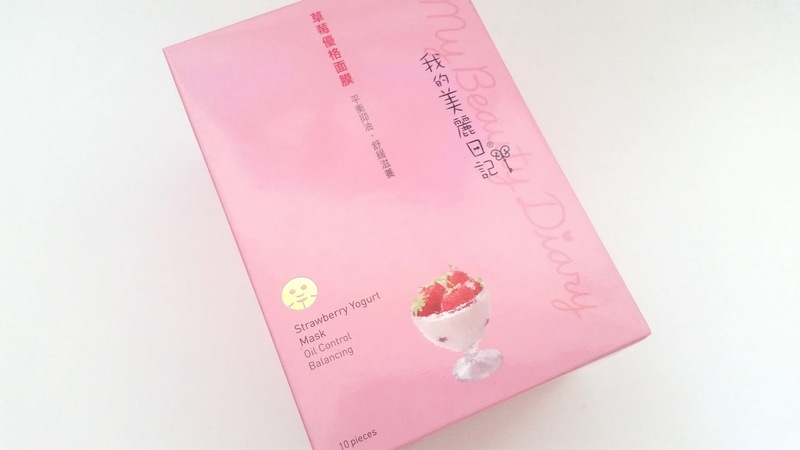 As I've mentioned before, I kept repurchasing these My Beauty Diary Strawberry Yogurt Masks due to their lovely scent and their amazing skincare properties. So, what properties do they offer? Well, the mask's focus is balancing and oil control. However, the mask also moisturizes well, brightens, softens, and provides nourishment to the skin. I personally love the brightening effects, it's a nice addition to the mask's sebum control properties. I would say the sebum control is not as awesome as the Apple Polyphenol masks but they are still pretty great. The Strawberry Yogurt masks always leaves my skin feeling soft and smooth. Plus, it provides nourishment to the skin, which helps to bring out that natural glow. These effects usually last well over a day as well. In addition to the amazing skincare properties, the scent of this mask is just too lovely to miss. If you love strawberry yogurt, you'll want to check this mask out. The masks contains added fragrance, so for those sensitive to fragrances, this might not be the mask for you. These MBD masks are generally inexpensive as well. They range from anywhere between $12 to $16 per box of 10 masks. If you are lucky and can find them on sale, they can go as low as $7-$8 dollars per box of 10. 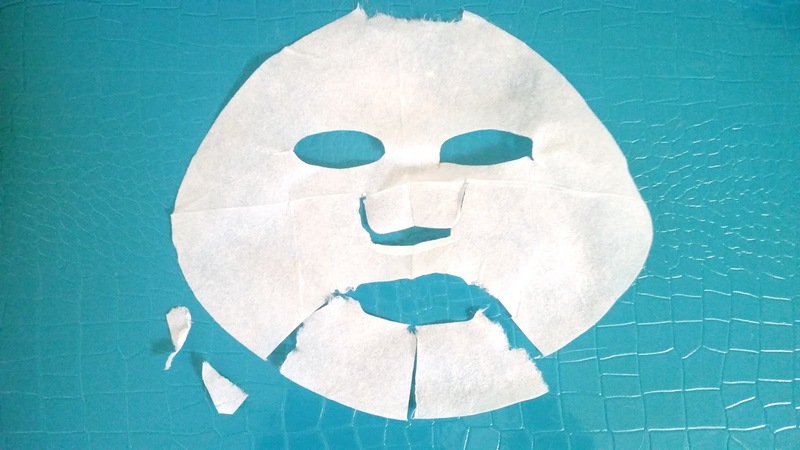 The sheet mask after it has dried. The parts on the side are ripped off from the forehead and chin areas. They are used on my nose area to cover the gaps that the mask doesn't cover. Final Thoughts: Overall, these My Beauty Diary Strawberry Yogurt masks are great masks. Otherwise, I wouldn't have repurchased them so many times. I love the scent of this mask and the skincare properties it offers are quite amazing as well. The masks always comes with a lot of essence and I usually just apply the excess on my neck and body. Will I repurchase these in the future? Yes! I want to try out the new mask material, so I will be buying these masks again in the future. Do I think these are worth a try? I think so. If you are not sensitive to any of the mask's ingredients and love the skincare properties it offers, then it is worth a try.